After nearly eight months of operation, Sydney’s 24-7 Street Kitchen and Safe Space was dismantled last Friday. 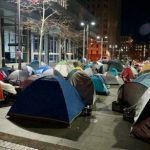 The community of around 60 rough sleepers currently residing there left the camp, which was situated out the front of the Reserve Bank in Martin Place. The homeless community made the decision to leave the pedestrian mall, after the NSW government rushed through an amendment bill, broadening police powers so they can now remove people and their items from crown land within the City of Sydney local government area. The legislation was passed last Wednesday night, just days after NSW premier Gladys Berejiklian told reporters that the people sleeping on the street in Martin Place were making her “completely uncomfortable,” and she wanted them moved on. However, in the end, the state government did nothing to protect the rights of the Martin Place rough sleepers, who are members of the public. Instead, NSW authorities threatened some of the most marginalised people in the community with the use of force. Australia ratified the International Covenant on Economic, Social and Cultural Rights on December 10 1975. Article 11(1) of the agreement provides that everyone has the right to adequate food, clothing and housing. It also requires signatory states to ensure this right is realised. 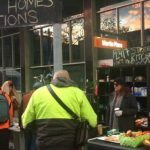 Sydney’s 24-7 Street Kitchen and Safe Space began operating in mid-December. The kitchen was providing around 400 to 500 free meals a day to the city’s needy. And the setup also provided people sleeping rough with a secure zone where they could spend the night. 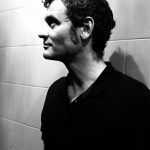 As Lanz Priestley, co-founder of the operation, explained back in May the safe space began after several homeless women reported waking up on the street in the middle of the night with men trying to sexually assault them. 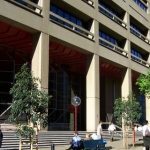 Initially, the setup was situated beneath a row of temporary construction hoardings on the side of the old Westpac building at 60 Martin Place. However in June, the City of Sydney homelessness unit moved in and evicted the residents. Then workers boarded up their shelter. At that time, Housing NSW did come through with an offer of temporary housing leading to permanent accommodation for those sleeping rough in Martin Place. And according to Priestley, those people did receive adequate housing. But as the weeks past, more of the city’s homeless joined the burgeoning community at the Martin Place site, where people were now sheltering in tents. New offers of temporary-only accommodation were made by the state government. But these were refused, as they would only provide a few nights in often inadequate and dangerous accommodation, and then an individual would be left to face the streets again alone. Sydney lord mayor Clover Moore had a change of heart early last week. She announced plans to provide the rough sleepers with a new site to stay temporarily, until she could provide a more permanent option. The only problem was there was no site to move to. And then the Berejiklian government swiftly changed the law, and threatened to send in NSW police. A similar incident occurred in Melbourne last January, when a group of homeless people sleeping outside of Flinders Street Station became the focus of political attention. Melbourne lord mayor Robert Doyle suggested the solution to the issue was to change the city’s bylaws to ban rough sleeping in the CBD. Under the proposed new bylaws, rough sleepers would be fined $250 for camping on the street, leaving their belonging unattended or ignoring orders to move on. 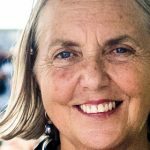 Melbourne city council has postponed the vote on the new laws until September, as its seeking advice after UN criticism. UN Special Rapporteur on the right to housing Ms Leilani Farha said, “The criminalisation of homelessness is deeply concerning and violates international human rights law.” She further condemned the laws as “legitimising discriminatory stereotypes” of a marginalised population. As for those who were sleeping on the streets outside of Flinders Street Station, the police were sent in to move them on in early February. Protesters that gathered to support the homeless people scuffled with officers, and five people were arrested. The affordable housing crisis is leading to growing numbers of people finding themselves without adequate accommodation. As of June 2016, there were 60,000 people on the social housing waiting list state-wide in NSW. And those on the list can be waiting for up to 10 years. Sydney has been deemed the second most unaffordable city in the world. In February, the last City of Sydney street count found there were 948 homeless people in the city. Of these, 433 people were sleeping rough, which was a 28 percent increase since 2011. 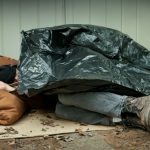 Homelessness NSW outlines that there are over 28,000 homeless people in the state. And the rough sleepers that left Martin Place last Friday account for 0.2 percent of people without a fixed address in NSW. 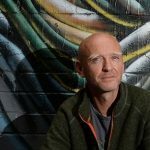 RMIT homelessness professor Guy Johnson has pointed out that most of the homelessness crisis in Australia is invisible. He estimates that those people sleeping out on the street are only a fifth of the nation’s overall homeless population. The safe space organisers were able to find a place to stay for many of the rough sleepers since they left Martin Place. And Housing NSW provided others with temporary accommodation. But as Mr Priestley explained it’s been rather inadequate, and the department forgot to provide food. Martin Place isn’t the only area of Sydney where homeless people congregate. There’s Belmore Park near Central Station, and Glebe’s Wentworth Park. And it’s clear that these people too are being move on, as one day their tents are present, and the next they’ve miraculously vanished. Lanz Priestley – the unofficial mayor of Martin Place – has been quoted as saying, “When you come across a situation and you look and think: somebody should do something about this. Remember, you are somebody.” Perhaps, it’s time for Australian governments to heed his advice. Is Trump Tweeting Us Into War with North Korea?